Join Kenny Graham and Joachim Meire for an unforgettable yoga and meditation retreat on the beautiful and warm island of Fuerteventura. The retreat includes energizing yoga and meditation sessions focusing on "flow and form" - a practice that will guide you towards personal alignment and a deeper connection to the breath. These sessions place an emphasis on safety of form, offer a variety of variations for postures, and promote greater strength and flexibility via an intelligent flowing sequence. We stay at beautiful Villa Azul complete with its facilities, views, gardens, and training deck. At Villa Azul in addition to sea views, comfortable common areas and our spacious wooden training shala, we have different accommodation for different budgets. This retreat is for anyone who wants to slow down, deepen their yoga practice and experience the peace and clam of sea and sanctuary. Each day there will be two form and flow hatha yoga classes offered. Each class includes meditation, claiming breathing techniques and asana (physical postures). Morning yoga class will be more upbeat preparing the body for sun and optional surf and the evening classes will be more meditative and mellow, targeted at relaxing the body and mind. All are invited, whether you want to do yoga and surf or just practice yoga, be ready for a life enhancing retreat. All levels welcome! Form and flow is a practice that guides students towards personal alignment and deeper connection to the breath. These classes place an emphasis on safety of form, offer a variety of variations for postures and promote greater strength and flexibility, via an intelligent flowing sequence. Fuerteventura is one of the 7 islands of the Canarian archipelago; It emerges from the Atlantic Ocean as a desert surrounded by sand dunes formed by the winds that bring sand from the Sahara forming fantastic dunes. Known for its turquoise waters, its splendid white sand beaches and the contrast with its volcanic landscapes makes this island very special. It’s main attractions are Lobos Island, Jadía Natural Park, Betancuria, Tindaya mountain and windmills. Located 97 km from the northwest coast of Africa, the Island of Fuerteventura, with 13 protected natural spaces, enhances its exoticism with palm trees and the appreciated aloe vera. Its kilometers of sandy beaches and golden dunes make life on the island a real privilege. Declared Biosphere Reserve and Starlight Reserve for the entire island territory, it has a huge protected area where you can discover the authentic tranquility. Disconnect from the daily routine and enjoy a new wellbeing journey on the sunblessed island of Fuerteventura, Canary Islands at beautiful Villa Azul. The Villa is located in Northern Fuerteventura a footstep away from the famous North Shore. It is in the small and tranquil village of Villaverde. We are 35 minutes from the airport and 15 minutes from the beaches of Corralejo, and just 20 minutes from the stunning beaches of west coast El Cotillo. You also will have included a good cleaning team mid week with towel change and bathrooms cleaned. Indoor and outdoor dining areas: There is a large dining room in the main villa, with a sitting area around and next to the dining area. In nice weather you will dine outside, on our lovely outdoor tables with a lovely garden view. Tea, coffee are provided throughout the day in the common lounge area. Three large private apartments with their own bathroom, kitchenette and terrace. 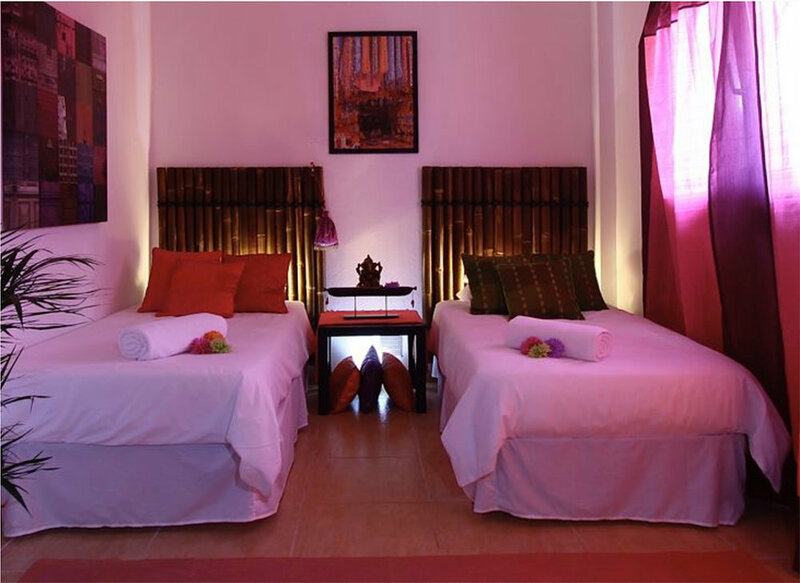 Villa Azul also has loverly private rooms with shared bathrooms and access to our large, bright common lounge/salon. Joachim Meire is the founder of Yogaland and the Yogaloft in Belgium. He has been practising yoga since 1999 and is an internationally certified teacher. On a regular basis he offers workshops, retreats and Yoga Teacher Trainings. Alignment Based Yoga is a dynamic yoga style taught by Joachim. The pace of the flow is seldom fast, but goes radically deep! Joachim emphasizes the harmonious alignment of body and spirit through asanas , pranayama, philosophy and meditation. His intention is to create more harmony and balance on a physical, mental, emotional and spiritual level. His thorough knowledge allows him to teach asanas tailored to the possibilities and limitations of your body, instead of forcing (read squeezing) your body into an asana. In a down to earth manner, Joachim interweaves yoga philosophy and great storytelling. With a good sense of humour and a soothing voice, Joachim guides you through each class, encouraging you to challenge yourself and experience the transformative power of yoga. His classes are fun, go radically deep and are an inspiration each time. His aim is for you to notice the effects of your yoga practice in daily life. Surfing is more than just a sport, it’s a passion and a lifestyle. Surfing a wave gives you a fantastic feeling… and because every wave is different you will never get enough of it! We teamed up with Protestt Surfschool to offer surf classes. Kenny and Joachim will go surfing daily and maybe you would like to give it a shot swell. Fuerteventura is the ideal place to learn surfing. Protest Surfschool goes wave hunting every day with beginner, intermediate and advanced surf lessons, in small groups or with a private surf coach. Surfing is fun, easy and for all ages! It’s all a matter of finding the good waves for your level and being coached by the right surf instructor! The Protest Surfschool step by step coaching program, and an individual approach to your surfing, is a guarantee for good results, and if wanted you can complete your surf course with specific surf training in the surfschool’s gym or with yoga/pilates sessions. Fuerteventura has perfect waves all year round: from beginner foamies to expert barrels and everything in between. Our passionate and experienced surf coaches have been surfing here on the island for many years and know exactly where to go with you according to your level!